Was diagnosed with a learning disability when he was in sixth grade and told that he would likely never make it to college—says this was his main motivation to succeed and prove everyone wrong. Attended the University of California, Irvine (UCI), where he got his bachelor’s degree in cognitive psychology with minors in biological sciences and education. He was the co-founder of UCI’s student chapter of Eye to Eye, which advocates for students with learning disabilities and seeks to diminish the stigma. His first job out of college was working as a youth leader for YMCA of San Diego County. 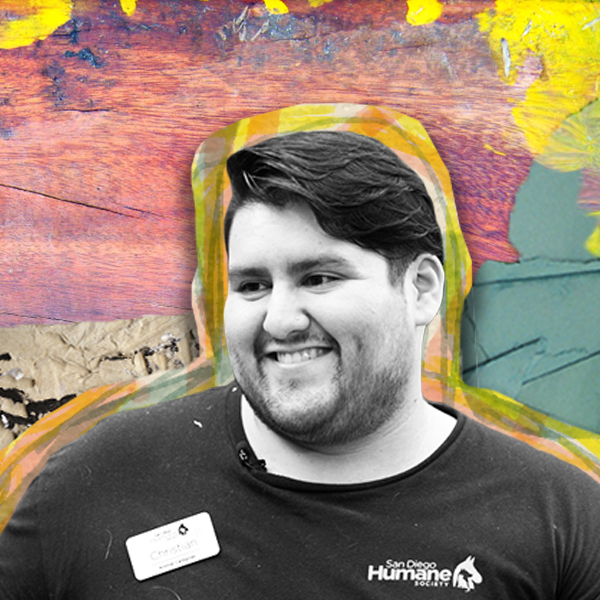 He has always had a love for animals, so he started volunteering at the San Diego Humane Society helping with admissions and other tasks at the shelter. This role eventually evolved into a full-time animal caregiver position—he provides the daily care to all of the shelter animals and helps ensure they get adopted into good homes. Later, he took on an additional role as a social media contributor, responsible for posting engaging Instagram content highlighting the inner workings of the shelter and the adoptable animals there. Inspired by his work with Eye to Eye in college, he is currently pursuing his master’s degree in education at the University of San Diego. I provide care and enrichment for shelter animals waiting to be fostered or adopted. As an animal caregiver, my daily tasks including cleaning the kennels and the animals as needed. Taking the dogs on walks and socializing them. Checking for any medical or behavioral issues. I also assist in making sure that the animals are fostered and adopted to good homes. As a social media contributor, I'm in charge of creating engaging and insightful content on Instagram that highlights the inner-workings of the animal shelter and highlighting pets so they can be adopted. Loving animals is a must. Be a team player. Get experiences wherever you can by volunteering or interning. It's ok to make mistakes. This is your growing time where you are allowed to figure things out. Try volunteering somewhere you are interested in. Getting out there can sometimes lead to great opportunities. "You aren't accepted to this school. You aren't what we are looking for." When I was applying to graduate school, I naively thought that it would be easy because I had already been through undergrad. It was crushing to have my top school of choice reject me. I just had to believe in the process and believe that everything would work out. It did and I still got into a great school. I was diagnosed with a learning disability when I was young and told I wouldn't make it through college. I used that doubt as my motivation. I co-founded the student chapter of Eye to Eye so that I could advocate for others like me.